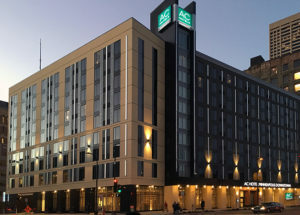 Located at the corner of 4th Street and Hennepin Avenue in downtown Minneapolis, this AC Marriott brand hotel is 9 stories and 131,000 square feet with 245 keys. 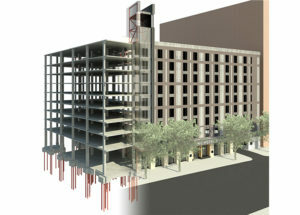 The primary structural system is 2-way PT flat slab and cast-in-place concrete columns (levels 2 through roof) with 2-way structural slab on grade supported on pile caps at level one. The lateral system uses concrete moment frames. Foundations are 7” round steel pipe piles driven to rock. 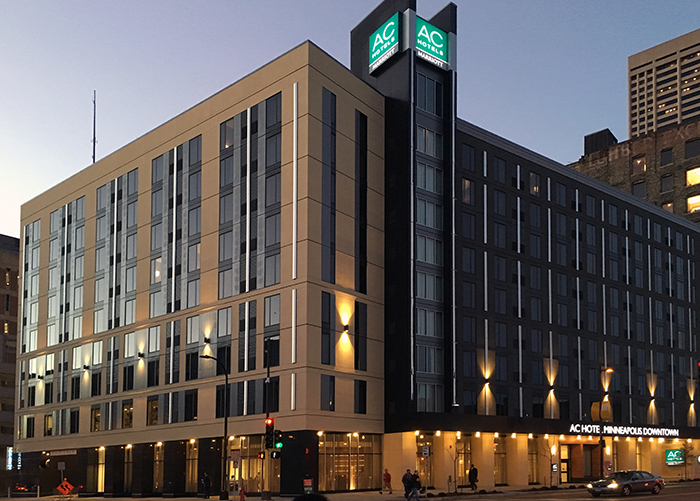 At the northwest corner of the hotel, feature signage framed in structural steel projects 20 feet above the roof. At level 3 a structural steel framed skyway links the hotel to an adjacent parking ramp.